Spa In April 2009, Thalasso Bali is renewal opened. They offer new menus such as; treatment using the BIODROGA products, Germany cosmetic brand; anti-aging package, and sliming, couple menu and many other new. They also offer kids club and baby-sitter. Please try full-scale Thalasso Therapy while feeling the blessing of the great sea. Free Spa Meal & Drink ! * For Gorgeou & Presious Beauty, Group package is not serve above meal & drink, those menus are already include meal. * Please enjoy spameal & drink at Spa cafe (about 20min～30min). It is out side treatment time. * They can provide Spa meal & drink for any treatment menu. Please contact us when you booking. Aquamedic Pool uses 38℃ sea water, and offering water exercise which is necessary for beauty and health. Expect improving body metabolism, getting rid of body fat, caring muscles, and detoxification effect, etc. In the pool, water jet massages all body parts, and relaxing on the bed in water at the end. In the original designed bath tub, it feels like lying down on a relaxation bed and floating. Well trained Hydro Therapist offers water jet massage to specific points of the body and treats muscle condition to relax. It has good effect for burning subcutaneous fat. Whole body massage by the high sea water jet. Controlling excess fat and revitalizing muscle condition. By inhalation of ion decomposed foggy sea water, purifying the respiratory organs such as throat and lungs. Recommended for having allergy and smokers. Soak foot in the gentle bubbled sea water Deluxe Bubble Foot Bath. Improving blood circulation and relaxation effect. Getting rid of foot horny substance, and taking pedicure. Aroma sensed Flower Bath with floating tropical flower petals. Spend luxurious sweet time of moisturizing skin, and deep relaxation. Using Indonesian traditional treatment, Sirih Leaf Bath with antibacterial and deodorant effect is luxurious Thalasso-style bath. This is one of the typical treatments in Thalasso Bali which includes various treatment effects in one program. Using Sea Salt Body Scrub and seaweed paste from French and treating French Massage and removing old skin and horny substance. It has effect of improving blood circulation, and feeling smooth skin after the treatment. It’s not recommended for children, aged people, or for sunburn skin. First, apply aroma serum on face, massage on face while relaxing with good sense. And then, taking the back massage with sea water shower and French style Body Massage by the therapist which improves body immunity, circulation, and muscle stiffness. Applying the French seaweed paste on skin, cover body by the electric blanket. It has effects of detoxification, burning subcutaneous fat, moisturizing by the seaweed nutrition, whitening effect, and decreasing subcutaneous fat, etc. Better effect is expected by scrubbing body to absorb the seaweed nutrition easily. This is the most popular treatment since Thalasso Bali opened. Please try. Applying the French seaweed paste on skin, cover body by the electric blanket. It absorbs body wastes and detoxifies. Besides, it has various effects such as preventing body odor, burning subcutaneous fat, and relaxation effect, etc. Better effect is expected by scrubbing body to absorb the seaweed nutrition easily. 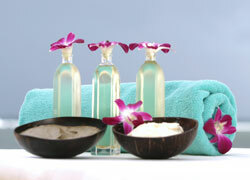 Aromatherapy French Massage by the well-trained therapist has relaxation and refreshed effect. Thalasso original blend aromatherapy oil is good for treatment sunburned skin, relax of muscles, and enhance sentiment, etc. Aromatherapy Balinese Massage is using Thalasso original blend aromatherapy oil, and applying stretch and finger presser combination to improve blood and oxygen circulation in the body and to enhance energy circulation; which leads deep relaxation and health. In addition, calming tissue damage, and then, calming muscle ache and arthritis. Also, reducing stress and keeping physical and psychological balance. This healing massage focuses on medical lymphatic stimulation. 85 min. Lymphatic Massage is the combination of the massage by therapist and Pressotherapy. This massage is the French Massage technique with the sea salt aroma therapy massage oil to improve detoxifying to make smooth and healthy skin. This massage focuses on decreasing subcutaneous fat by knead technique based on the lymphatic massage with using anti-cellulite oil. Put heat jell and cooling jell that has effect of decreasing subcutaneous fat on the particular parts of fat. Calm pain by lighting infrared light with lymphatic massage. Recommended for who has muscle ache and menstrual pain. Regardless of having pain on body or not, infrared light has effect of warming body with relaxation. Warn stones stimulus lymph gently. And, it has effect of improving nutritious circulation through body. Cold stones stimulus muscle nerves and improve blood circulation and a nervous system. And, it has detoxification effect. The healing effect by warm stone and the refreshment of cold marble lead recovering vitality. In addition, it has effect of preventing to catch a cold, such as gaining immunity, decreasing stress, nervousness, muscle pain and tiredness. This treatment is the combination of the Traditional Thai Healing Treatment and Aromatherapy Balinese Massage. Using the Herbal Ball to press body, that is Thalasso Bali original 12 kinds of herbal blend. It has many kinds of effects such as reducing a nervous disorder, pain, a sprain, rheumatism, and healing effect. Enjoy physical and psychological healing with sense of herb and warmness. It’s the Indian style Long Stroke Massage through foot to neck. Choosing oil by Doshas (energy), and recovering normal body balance. It has effects of reducing pains, calming high blood pressure, detoxification effect, and moisturizing for skin, etc. Perhaps, it might be new experience of massage technique and medial herbal oil along with your Doshas. Shirodara is one of the most popular Ayurvada in India. The purpose of Ayurvada is reaching total quietness and calmness. It also has anti-aging affect. Thalasso Bali’s Shirodara oil is made by the Indian Ayurvedic doctor, and it is used for head, head skin, neck and shoulder massage with deep relaxation and releasing from nervousness and stress. The therapist applies massage to the specific spots to stimulus body system in order to revitalize yourself. Please stay calm without thinking anything, especially, when the warmed medical herbal oil fall down on your third chakra (the center of forehead) for 20 min. We prepared 8 kinds of Body Exfoliation. All of them are using natural products, and all scrubs has effects of getting rid of dirty and horny substance and creating smooth beautiful skin, plus, improving blood circulation. Applying your favorite scrub and taking 100 % sea water Great Shower; that revitalize body and decrease subcutaneous fat. Enjoy Thalasso Bali original Body Exfoliation as massage. The gentle sense of milk covers the body, and it has whitening effect, moisturizing effect, and relaxing effect; good for all skin types. Avocado’s moisturizing effect, and Aloe’s whitening effect and cool-off effect treat damaged skin under the sun of Bali. Use the cool pack for sunburned skin, and use the warm body wrap for seeking effect of moisturizing and relaxation. This trestment gives mosture for your skin and make soft skin. Create moisturized skin with water. After sof cleansing, Aloe bera face mask care for sensitive skin too. Using European brand basic cosmetics, and for Face Pack, using the day’s special organic Bali vegetable and fruit, and non-chemical compound pure honey mixed. Please feel the change of skin by nutrition from natural materials. The list below is example of the day’s special vegetable and fruit, and explanation of honey effect. Avocado：As same effect as vitamin A and B, it gives water into multiple irons and potassium, and it is nutritious skin food. Good effect for dried skin and preventing wrinkles. Carrot：It contains glucose, iron, copper, vitamin C, D, E, K and carotene which is the most precious nutrition for carrot pack, and it creates natural brighten skin. It is especially effective for oily skin. In addition, it prevents wrinkles to keep fresh skin. Bengkoang： It contains rich beta-carotene and vitamin A, B, C, D, E. Bengkoang improves natural whitening and creates soft skin. Tomato：This tasty fruit removes dirty in pores and improves natural brightness of skin. Tomato contains anti-oxidizer, and it also has effect to preventing wrinkles by removing horny substance. Pure Honey：It includes rich mineral and protein, and pure honey has anti-aging effect and moisturized skin. It is the rich the treatment to put honey directly to skin. This Facial use Seaweed Facial Mask of Phytomer, French marine product top brand. Not only face treatment but also neck treatment, it creates wet smooth skin. Face massage by the professional therapist is expected lift-up effect. We prepared really rich and gorgeous Golden Caviar Facial. By the rare and pure essence of caviar, creating brighten smooth white skin. This product was prized Spa Asia 2008 best product; it is great anti-aging facial that moisture and revitalize to aged skin. Enjoy Thalasso Bali style luxurious head and hair treatment. The Bali traditional Hair Cream Bath uses the cream with fresh aloe vara and essential oil, and it revitalizes hair roots. Moreover, Aromatherapy massage oil improves calming muscles through neck to shoulder. Shampoo and conditioner are Thalasso Bali original aromatherapy products. After washing hair, putting the special vitamin for hair and hair skin to improve hair grow and shining. Thalasso Bali Manicure is removing hands’ horny substance and dirty by avocado scrub. Additionally, making hands relaxed by Aromatherapy Hand Bath, and applying hands massage and nail care. By using lemon essential oil, protect cuticle layers. Your favorite 1 color or Choose French Manicure or Marble. Treat gently tired legs. This little bit luxurious Pedicure uses peppermint essential oil for foot wash and sea salt scrub with peppermint to remove horny substance and dirty, and then, apply nail care. Peppermint essential oil has great effect of sterilizing bacteria and refresh. First, detoxifying and calming muscle stiffness in Aquamedic Pool. Long stroke Abhyanga Massage and other treatments improve circulation, decrease stress, and adjust physical and psychological balance in order to revitalize body. Short beauty course for a whole body including body massage, scrub and facial. Feel Thalasso Therapy and bless of nature to whole body. It has great effect to beauty and relaxation. The whole body treatment uses sea water and seaweed or sea water and sea mud. It contains rich mineral and vitamin, and they have good effect to be beautiful naturally. 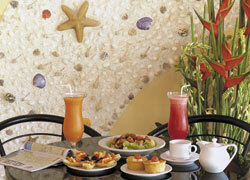 This menu includes a swallow’s nest dessert at spa cafe and meal in the restaurant of Grand Mirage. Why don’t you gorgeously spend your precious day for yourself in Thalasso Bali? It must be great luxurious experience of revitalizing your body from inside and outside. Enjoy the exotic sense of Bali, and heal the tiredness of travel with your partner. After Thalasso Therapy of sea water jet in Aquamedic Pool, treat the body gently with natural sweet sense. Lip balm present. Thalasso Luxury Anti-aging is the combination of Thalasso Therapy and gorgeous Biodroga Golden Caviar Facial. Use enough sea and natural materials, and revitalize the body beauty gorgeously. In Aquamedic Pool, massage by warm sea water jet, and burning subcutaneous fat while removing muscle stiffness and improving blood circulation. In order to reduce weight, apply Thermo Effective Slimming Massage. This is the Thalasso Bali original healing program with cooled aloe vara for damaged body and hair by the strong UV. Aloe vera jell has effects of preventing bacteria’s breeding and offering deep healing. Moreover, aloe vera’s Aloetin B improves immunization system. Aloe vera jell is often used for caring a skin burn. For head skin and hair, apply Cream Bath by suitable cream for hair type. After the treatment, you can bring back the rest Cooling Cucumber & Aloe vera Jell as a souvenir, so please care your skin by yourself at home. Recommended program as designed for sanitary of women’s delicate zone. Prevent bacteria’s breeding, and remove toxin and odor of whole body. It is also recommended for men to remove toxin and odor. Detoxify and refresh your body in the sea water and seaweed bath. Get rid of tiredness by Aromatherapy French with favorite aroma oil, Balinese Massage or Lymphatic Drainage Massage, and remove skin dirty by favorite scrub. Feel new body and mind, and start fresh brand new day. Thalasso Bali reproduces precisely the traditional Indian Ayurvetic Treatment. It is the combination of Abhyanga Massage and Shirodara. It has effects of calm high blood pressure, keeping psychological balance, and detoxification, etc. so after the treatment, you feel lighten your body because of releasing from tiredness and stress. Please experinece the great effect. Thalasso Affusion Shirodara is the combination of Indian Shirodara and French Affusion Shower Massage, and it’s Thalasso Bali’s original treatment. We offer the new relaxation of relaxation by sea water, activating the third eye by Shirodara, and massage and scrub by the therapist. Yoga can prevent lifestyle disease and an internal disease and cure physical pains. By combining each Talaso treatment, it improves a healthy cycle. For pregnant woman, it calms sciatica and arthritis, etc. The treatment reduces headache from anxiousness and stress. This package that is offered by the skillful therapist with marine power is recommended for the pregnant tourists in Bali. This is the program for children; while you are taking treatments, you can leave your children to us without anxious. It includes Kids Relaxation Massage, Chocolate Body Scrub for back and legs, Milk & Flower Body Wrap and Mini Cream Bath. All treatments are offered under the care of professional therapist. Why don’t you try this for your children’s Thalasso Bali debut? This is the special package for after sightseeing or after check-out the hotel and while waiting of the departure time to recover from tiredness and refresh physically and psychologically. 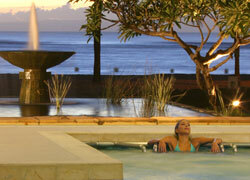 Calm down your mind to get rid of tiredness and stress in Thalasso Bali by the departure time. Cancellation fee is required one day before booking day. Please call us 2 days before your booking day in case of cancel booking. * Free Shuttle Service in Nusa Dua area. * Pick-up service is available only the time that one group application is over US＄242 in Jimbaran, Kuta, Legian, Seminyak, Sanur area. * Under 11 year-old, the children’s special menu is available. Regular menus are available over 12 year-old. * Baby Sitter service is ＄5 for 1 hour. Available 24 hours. * Please arrive at the spa 15 min. before the treatment starts. We offer the counseling. * For using Aquamedic Pool, please bring your own bathing suits. Rental bathing suits are available, but the number is limited. Balinese massage is not painful at all. I felt very good with warm oil and I almost fell asleep. After the treatment my skin becomes smooth and soft.